The road to Game 6 started with some pretty simple questions. What do we like about Outwitters, and what could we have done a better job with? As game designers, we explored these questions with lots and lots of prototypes. Some of them never got passed the “idea” phase to a playable state, like this abandoned “gameboard” file I found while digging through our old stuff. I think I was in the middle of figuring out what size everything needed to be on a phone screen. We explored all kinds of stuff. Should moving a piece really cost you a wit? What about square spaces instead of hexes? What if you could push people into pits? Does that kill them? How can we make teams more unique from each other without adding a ton of production time to new races? This is one of our more “out there” prototypes; what we’re working on now is a lot closer to the classic Outwitters map setup. 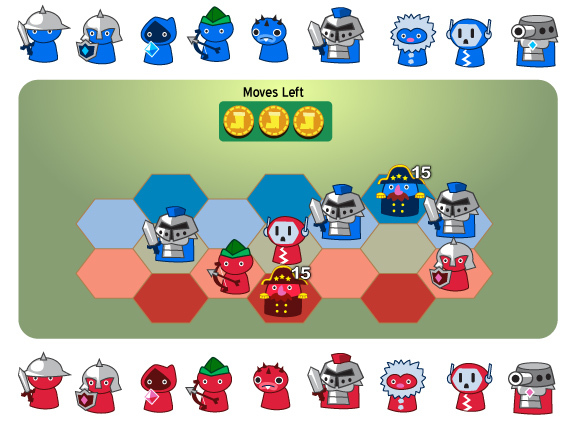 I throw these gameboards together in Adobe Illustrator (much faster than having Alex actually code them), create a quick and dirty PDF manual, and we copy/paste game pieces around the board to play. I called this prototype “CQC” because we were experimenting with very small boards. Positioning your units was important, but it wasn’t as crucial as how you played your character’s abilities. Only red team could move on the red spaces, and only blue team could move on blue. The three brown spaces in the middle could be used by anyone. Your general, the mustachioed guy, could only jump between the 3 dark spaces, and you lost if he was defeated. Each player had a deck of cards with troops you could spawn and crystals to trigger their special moves. As you can see we had lots of different minions, and you could choose which ones you wanted to add to your deck.